The relationship between photography and social identity is as old as the invention of the camera — this, despite the fact that its earliest developers thought that their newfangled device was best suited for other purposes. For example, the Englishman William Henry Fox Talbot argued the camera best functioned as an aid to the natural sciences or, indeed, for any pursuit requiring careful observation and easy reproduction, as long as it did not have anything to do with people. However, photography’s more expansive role in the depiction of identities — arguably, its more lasting role — almost immediately found fertile ground among commoners. Already in December 1839, mere months after photography’s invention was announced in Paris and London, the illustrator Théodore Maurisset drew “La Daguerreotypomanie,” a caricature about the new craze for pictures (fig. 1). Figure 1: Théodore Maurisset, La Daguerreotypomanie (Daguerreotypomania), December 1839, lithograph, The J. Paul Getty Museum, Gift of Samuel J. Wagstaff, Jr. Digital image courtesy of the Getty’s Open Content Program. 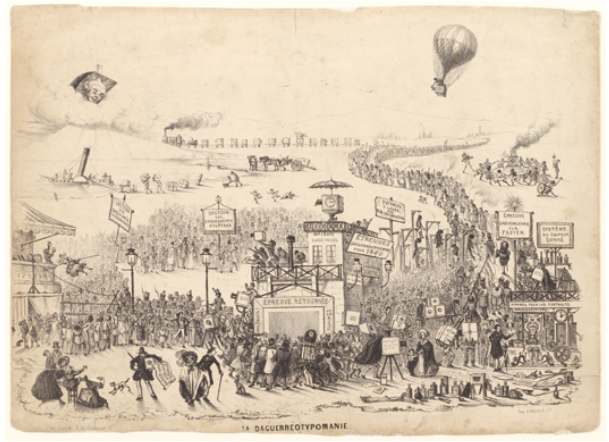 In his lithograph, so many hordes of anonymous people line up to buy a camera or have their picture taken that the landscape is inundated by their frenzy. The people cause havoc, elbowing each other this way and that, clogging the environs, storming the front doors of the small photo studio, leaping from rafters to get a better place in line, hankering for photographs. The police cannot keep order; portrait painters, realizing their careers are forever changed, hang themselves in the distance; and above the fray, in a hot-air balloon, an eager photographer, with a brand new camera in hand, takes a picture of the unruly scene spread out below. Modern identities are in the making! From our perspective, it’s easy to see why the camera was embraced by so many people, who thought of it as a means of self-representation, despite what its inventors proclaimed. Previously, those who could afford to have images made of themselves were almost invariably of the upper-middle and ruling classes. They had the income and leisure to sit for the portrait painter. But suddenly, with the camera, the power of such imagery — of a personal and public cry of individuality and self-worth — came within reach of ordinary folk. Portraits and self-portraits seemed to match other political and social developments that gave voice to individuals, like the push for the universal right to vote or, in England and France at the time, the revolution for self-governance amidst traditions of monarchy. 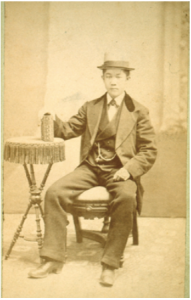 Figure 2: William Hurd, Ah Chong, 1875, albumen photograph, private collection. The constructed nature of identities, as facilitated by photography, persists in the work of this year’s WYNG Masters Award finalists. In very sophisticated ways, they explore how identities are made in today’s globalized, interconnected, intensely visual world. In some cases, the ambitions that urged photography’s earliest sitters to take to the lens continue to inform these photographers’ practices. These include capturing the experiences of today’s migrant workers and refugees, as in Emmanuel Serna’s project on the displaced settlers from the Indian subcontinent. In different ways, Remmus Ha and the team of Leung Chi Wo and Sara Wong explore the indecipherability or, in the latter case, the anonymity of individuals as we encounter them on the streets (and in history); and they are attentive to how, in these fleeting encounters, our social identities are often boiled down to the smallest gesture—a crooked neck, an arched back, a pointing finger, a passing nod — or to a chic outfit or a revealing accessory. In these photographers’ hands, pictures make visible but also cannot hope to capture the fullness of individuals. In Dinu Li’s work, the photographer traces his family’s immigrant story, which includes not only his own life experiences but also those of his mother’s. The fact that her experiences were passed down to him as bedtime stories — as “postmemories,” as others have called it, and therefore not things he necessarily felt or remembered himself — do not make them any less important to his sense of self.2 In fact her memories mark him as indelibly as if they were his own. Or consider the work of Siu Wai Hang, who photographs not people but places, especially those sites in and around Hong Kong that served as points of entry for illegal immigrants. In these places, the quiet cityscapes and waterscapes carry echoes of traumatic historical meaning and are shaped by the activities of illegals and the constraints imposed by officials, of individual desires and the order of law. Such conflicts, we now know, are not incidental to the making of modern identities but in fact deeply constitutive of them. As in the case of the camera’s early relationship to political developments for self-representation in England and France, we might ask what in Hong Kong’s current situation has produced a renewed interest in identities of these sorts. One answer, proposed by Johnny Gin in his project on the Architecture of Insurgency, is the recent Occupy Movement, the 2014 street culture of protest that arose in response to the seemingly stage-managed election for Hong Kong’s Chief Executive. In Gin’s pictures, we see the makeshift barricades that once clogged the streets and the entrances to government buildings during the long days and nights of civil disobedience. But they are now empty. Where are you, the camera seems to ask, you people who stood by these broken rails and littered fences? What kind of person are you? Tell me more about you. Use your camera to tell me. 1 On these shoemakers and their use of photographs, see Anthony W. Lee, A Shoemaker’s Story: Being Chiefly About French Canadian Immigrants, Enterprising Photographers, Rascal Yankees, and Chinese Cobblers in a Nineteenth-Century Factory Town (Princeton: Princeton University Press, 2008). 2On postmemory, see Marianne Hirsch, Family Frames: Photography, Narrative and Postmemory (Cambridge: Harvard University Press, 1997).